Despite the frustratingly idiotic naming of this new series (Dawn of the Planet of the Apes comes after Rise of the Plant of the Apes, really?) Matt Reeves’ sequel to the surprise hit of 2011 is an impressive big budget special effects movie that isn’t afraid to actually take the time to give its characters depth. Set a decade or so after Rupert Wyatt’s film, Dawn presents us with a post-apocalyptic world. The simian virus has all but wiped out humanity, and the new super-intelligent apes have created their own semi-civilised society in the new wilderness that has been allowed to flourish. It doesn’t take long for some humans to stumble across a group of apes led by Caesar, however. Though both have the best of intentions, it seems that war is inevitable. Dawn of the Planet of the Apes is a tragedy of sorts. We all know the trajectory that the series is taking, so it’s unsurprising that there are few real surprises in the film. The script instead focusses on giving all the enemy combatants good reasons to be doing bad things. House of Sand and Fog this isn’t, however it does show an admirable sense of balance in depicting the two warring sides. Jason Clarke, Keri Russell and Tobi Smit-McPhee make up the central human characters, and it is a little disappointing that their story isn’t more interesting. 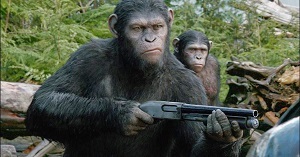 Instead, it’s Andy Serkis, Toby Kebbell and Karin Konoval that steal the show as the all-important apes. Serkis again outdoes himself; he truly is the master of motion capture performance. For the most part, the apes speak in sign language, only vocalising occasionally, and it’s incredible just how emotive these creatures can be. It’s the perfect marriage of human performance and digital trickery. I can’t even begin to imagine just how big the effects budget was for this film. The visuals are, for the most part, as good as they can be in 2014. There are a dozen moments that don’t truly convince, but I guess that’s to be expected when the film is this ambitious.